Solid empirical data and statistics are absolutely essential in order to measure the progress and evaluate the efficiency of the Union’s policies and programmes, especially in the context of the Europe 2020 Strategy set out in the Commission Communication of 3 March 2010 entitled ‘Europe 2020: A strategy for smart, sustainable and inclusive growth’ (Europe 2020). Pursuant to Regulation (EC) No 223/2009 of the European Parliament and of the Council of 11 March 2009 on European statistics (2), a multiannual European statistical programme (the ‘multiannual programme’) should be established, providing a framework for funding Union actions. In accordance with Regulation (EC) No 223/2009, the multiannual programme should provide the framework for the development, production and dissemination of European statistics, the main fields and the objectives of the actions envisaged for a period not exceeding five years. It should lay down priorities concerning the needs for information for the purpose of carrying out the activities of the Union. Those needs should be weighed against the resources needed at Union and national level to provide the required statistics, and also against the response burden and the respondents’ associated costs, paying particular attention to cost-effectiveness. The development, production and dissemination of European statistics within the legislative framework of the multiannual programme should be achieved through close and coordinated cooperation within the European Statistical System (ESS) between the Union statistical authority, which is the Commission (Eurostat), and the national statistical institutes and other national authorities as designated by the Member States (3) (collectively, ‘national statistical authorities’). Professional independence of the national statistical institutes and the Commission (Eurostat) is essential for providing credible and high-quality statistical data. Closer cooperation between the Commission (Eurostat) and the national statistical institutes is absolutely essential, in order to enhance the quality of European statistics. Such closer cooperation should focus mainly on the provision of further methodological training on statistics and related matters, on the development and dissemination of existing good practices within the ESS, and on the exchange of staff between the Member States and the Commission (Eurostat) in both directions. The implementation of the multiannual programme is an opportunity to produce harmonised European statistics in order to contribute to the development, production and dissemination of common, comparable and reliable statistical information at Union level. High-quality statistics developed, produced and disseminated under the multiannual programme are essential for evidence-based decision-making, should be available in a timely manner and should contribute to the implementation of Union policies as reflected in the Treaty on the Functioning of the European Union (TFEU) and Europe 2020 and other policies addressed in the Commission’s strategic priorities for 2010-14, namely strengthened and integrated economic governance, climate change, reformed agricultural policy, growth and social cohesion, gender equality, a people’s Europe and globalisation. They should be fostered through actions which are financed under the multiannual programme where the Union can bring a clear added value, and which aim at ensuring that economic, social and environmental indicators are all treated on an equal footing. When defining statistical areas to be developed, the objectives of Regulation (EU) No 691/2011 of the European Parliament and of the Council of 6 July 2011 on European environmental economic accounts (4), which relate to the development of new environmental economic account modules, should be taken into account. In addition, particular attention should be paid in statistical studies to the impact of fiscal consolidation programmes on workers and other citizens. Statistical data should be collected in such a way as to ensure the visibility of developments in individual Member States, such as developments regarding unemployment, the amount of and changes to social transfer payments, the number and quality of jobs, labour mobility within the Member States, within the Union and between the Union and third countries, and the related socio-geographical changes in pay structure and training measures. In recent years, the ESS has been faced with a number of challenges. First, a lack of high-quality national statistics can have detrimental effects on Member States and on the Union in general. Consistently accurate and high-quality statistics, produced by the professionally independent national statistical institutes, are therefore absolutely essential for the purposes of policy-making at national and at Union level, and, in particular, in the context of the euro area’s supervisory mechanisms. Second, the need for European statistics has been constantly increasing, and this trend is unlikely to change in the future. Economic globalisation represents a specific challenge, requiring the development of new metrics to measure global value chains in an internationally coordinated way, thereby providing a better picture of economic growth and job creation. Third, the nature of needs is constantly changing, requiring more synergy between statistical domains. Fourth, appropriate breakdowns of available data can make it easier to monitor the effects of the economic and financial crisis and the impact of implemented policies on citizens, including the most vulnerable. Fifth, the nature of statistics has changed. They are no longer merely one source of information for policy-making purposes, but are now at the very heart of the decision-making process. Evidence-based decision-making requires statistics that meet high-quality criteria linked to the specific purposes they are serving, and there is an increasing need for complex multidimensional statistics supporting composite policy areas. In order to respond correctly to policy-making requirements, gender disaggregated data is necessary, where appropriate. Sixth, due to the appearance of new actors on the information market, including those providing information in nearly real time, the priority for the ESS in future is high quality, including timeliness. Seventh, budget constraints at both national and Union level as well as the need to further reduce the burden on enterprises and citizens make the situation even more challenging. The Commission Communication of 10 August 2009 on the production method of EU statistics: a vision for the next decade, and the ESS strategy for its implementation, address all those seven challenges by aiming to reengineer the ways of working in the ESS in order to make it more efficient and flexible. The implementation of that Communication constitutes the core of the multiannual programme within the framework of the joint ESS strategy. To ensure the integrity and quality management of the development, production and dissemination of European statistics under this Regulation, the national statistical institutes and the Commission (Eurostat) should take all necessary measures to maintain public confidence in statistics and to allow for a more rigorous application of the European Statistics Code of Practice in force and of the Commission Communication of 15 April 2011 entitled ‘Towards robust quality management for European Statistics’, while complying with the principles set out therein. With the aim of better matching the limited resources available to national and European producers for producing European statistics with the increasing needs for statistics, the preparation phase of the Commission’s annual statistical work programmes, which spell out in detail the multiannual programme, should include a systematic and thorough review of statistical priorities that will reduce less important requirements and simplify existing processes, while at the same time improving the reliability and maintaining the high-quality standards of official statistics. Account should also be taken of the burden on respondents, be they businesses, central, regional or local government units, households or individuals. The process should be pursued in close cooperation with both the users and the producers of European statistics. In this context, reasonable financial burden-sharing between the budgets of the Union and the Member States should be achieved. In addition to the financial allocation set by this Regulation, the national statistical authorities should therefore receive at national level the appropriate funding for carrying out the individual statistical actions decided for the implementation of the multiannual programme. In view of the compliance burden, particularly on smaller Member States, the Commission (Eurostat) should be able to provide technical assistance and expertise to Member States to help them tackle research constraints and major methodological obstacles, with a view to ensuring compliance and the provision of high-quality data. The financial envelope of the multiannual programme should also be allocated in such a way as to cover the expenses needed for improving the process for producing high-quality European statistics, and the capacity to do so, and for the training needs of national statisticians. Financial contributions by the Union should support actions for the development, production and dissemination of European statistics as set out in this Regulation. They should take the form of grants, public procurement contracts or any other interventions needed for the purposes of achieving the objectives of the multiannual programme. In this context, the use of lump sums should be a principal means of simplifying grant management. Pursuant to Article 15 of Regulation (EC) No 223/2009, an adequate financial structure should be developed to support collaborative networks. Provision should be made to open the multiannual programme to participation of the countries of the European Free Trade Association participating in the European Economic Area (‘the EEA/EFTA countries’) and to Switzerland. Provision should also be made to open the multiannual programme to participation by other countries, in particular the neighbouring countries of the Union, countries which have applied for membership of the Union and candidate and acceding countries. In the context of the implementation of the multiannual programme, where appropriate, cooperation with third countries not participating in the multiannual programme should be encouraged, taking into account any relevant agreements, or any envisaged agreements, between those countries and the Union. In order to be considered as financing decisions according to Article 84(3) of Regulation (EU, Euratom) No 966/2012 of the European Parliament and of the Council of 25 October 2012 on the financial rules applicable to the general budget of the Union (5) (‘the Financial Regulation’), the annual work programmes adopted by the Commission for the implementation of the multiannual programme have to set out the objectives pursued, the expected results, the method of implementation and their total amount. They must also contain a description of the actions to be financed, an indication of the amount allocated to each action and an indicative implementation timetable. It is desirable that they also set out the relevance of the objectives pursued to the users’ needs and a project plan. For grants, they should include the priorities, the essential evaluation criteria and the maximum rate of co-financing. Moreover, the annual work programmes should include appropriate indicators for monitoring outcomes. Since the objective of this Regulation, namely to establish the multiannual programme, cannot be sufficiently achieved by the Member States and can therefore be better achieved at Union level, the Union may adopt measures, in accordance with the principle of subsidiarity as set out in Article 5 of the Treaty on European Union. In accordance with the principle of proportionality, as set out in that Article, this Regulation does not go beyond what is necessary in order to achieve that objective. An ex-ante evaluation has been performed in accordance with the principle of sound financial management, in order to focus the multiannual programme on the need for effectiveness and efficiency in achieving its objectives and in order to incorporate budgetary constraints from the design phase of the multiannual programme onwards. The value and impact of the measures taken under the multiannual programme should be regularly monitored and evaluated, including by independent external evaluators. For the purpose of evaluating the multiannual programme, measurable objectives have been formulated and indicators developed. For 2013, this Regulation lays down a financial envelope for the multiannual programme, which, in the framework of the annual budgetary procedure, is to be the prime reference for the budgetary authority within the meaning of point 37 of the Interinstitutional Agreement of 17 May 2006 between the European Parliament, the Council and the Commission on budgetary discipline and sound financial management (6). In addition to the financial envelope set by this Regulation, the individual statistical actions aimed at implementing the multiannual programme, including actions taking the form of an agreement between the national statistical authorities and the Commission (Eurostat), should receive, to the extent possible, appropriate funding at national level. The impact assessment for this Regulation, indicating cost savings for the Union and the Member States, is the basis for the commitment of finances to the multiannual programme. Cost savings will result, in particular, from new methods of production of European statistics resulting from developments in the areas of information and communication technology. The financial interests of the Union should be protected through proportionate measures throughout the expenditure cycle, including the prevention, detection and investigation of irregularities, the recovery of funds lost, wrongly paid or incorrectly used and, where appropriate, penalties. In order to ensure the continuity of statistical operations under the ESS for the entire calendar year of 2013, and for the purpose of legal certainty, this Regulation should enter into force on the day of its publication and should apply from 1 January 2013. The date of application of this Regulation should, in particular, serve to justify payments to contract staff as well as all activities under the programme. The European statistical programme for the period from 2013 to 2017 (‘the programme’) is hereby established. The programme represents the added value of ensuring that European statistics are focused on the information needed to design, implement, monitor and evaluate Union policies. In addition, it contributes to the effective use of resources by fostering actions which provide an essential contribution to the development, production and dissemination of harmonised, comparable, reliable, user-friendly and accessible statistical information based on uniform standards and common principles set out in the European Statistics Code of Practice (‘Code of Practice’), as adopted by the European Statistical System Committee (ESSC), in particular the quality criteria of relevance, accuracy and reliability, timeliness and punctuality, accessibility and clarity, and coherence and comparability. 1. This Regulation provides the programming framework for the development, production and dissemination of European statistics, the main fields and the objectives of the actions envisaged for the period from 2013 to 2017, in accordance with Articles 13 and 14 of Regulation (EC) No 223/2009. 2. The programme does not cover measures provided for by the Programme for the Modernisation of European Enterprise and Trade Statistics (‘the MEETS Programme’), established by Decision No 1297/2008/EC of the European Parliament and of the Council (9), until the end of the MEETS Programme on 31 December 2013, but includes objectives in the area of enterprise and trade statistics planned to be implemented from 2014 to 2017. 1. The general objective of the programme is for the European Statistical System (ESS) to continue to be the leading provider of high-quality statistics on Europe. — Objective 4: ensure that delivery of such statistics is kept consistent throughout the whole duration of the programme, provided that this does not interfere with the priority-setting mechanisms of the ESS. 3. The general and specific objectives referred to in paragraphs 1 and 2 are elaborated further in the Annex, together with the indicators used for monitoring the implementation of the programme. In accordance with Articles 13 and 14 of Regulation (EC) No 223/2009, the programme shall be subject to detailed annual planning which will include a priority-setting mechanism as an integral part of the process. The objectives of the programme shall be achieved through close and coordinated cooperation in the ESS. The programme shall include the development of appropriate instruments resulting in enhanced quality, a greater flexibility of the ESS and the increased ability to satisfy users’ needs in a timely manner. It shall also pioneer the development of reliable indicators able to meet the challenges of the 21st century, namely measuring environmental sustainability, quality of life and social cohesion, and record economic activity in the tertiary sector and the social economy. 1. European statistics shall be produced in a professionally independent and transparent manner. 2. The programme shall be implemented in accordance with the principles of the Code of Practice with a view to producing and disseminating high-quality, harmonised and comparable European statistics in accordance with Article 12 of Regulation (EC) No 223/2009, and ensuring the proper functioning of the ESS as a whole. The national statistical institutes and the Union statistical authority (Commission (Eurostat)) shall ensure, through their professional independence, that European statistics comply with the Code of Practice. cooperate with statistical bodies at international level in order to promote the use of international concepts, classifications, methods and other standards, in particular, with a view to ensuring more coherence and better comparability at global level. 4. Each Member State shall endeavour to ensure that its statistical production processes are set up in a standardised manner and are enhanced, to the extent possible, by audit mechanisms. 5. In the interest of transparency, the Commission (Eurostat) shall, where appropriate, disclose publicly its assessment of the quality of national contributions to European statistics as part of the quality reporting and compliance monitoring exercise. 6. The Commission (Eurostat) shall consider how to make its publications, particularly those which are accessible via its website, more user-friendly to non-professionals, and shall allow easy access to complete data series and include intuitive comparative graphs in order to give more added value to citizens. The periodic updates of the Commission (Eurostat) shall provide, where possible, information on each Member State and shall offer annual, monthly and long-term data series, where appropriate, and where the benefits are greater than the costs of collection. 1. The programme shall ensure statistical initiatives underpinning the development, implementation and monitoring of current Union policies and shall provide statistical support for important requirements resulting from new Union policy initiatives. 2. The Commission shall, in the preparation of the annual work programmes referred to in Article 9, ensure effective priority-setting and an annual review of, and report on, statistical priorities. The annual work programmes will thereby aim to ensure that European statistics can be produced within the available resources at the national and the Union level. Prioritisation shall contribute to the reduction of costs and burdens for new statistical requirements by reducing statistical requirements in existing domains of European statistics and shall be pursued in close cooperation with the Member States. 3. The Commission shall ensure the development and implementation of instruments to annually review the priorities of statistical activities in order to contribute to the reduction of costs and burdens on data providers and producers of statistics. 4. When putting forward new actions or introducing major revisions of existing statistics, the Commission shall duly justify such actions or revisions and shall provide information with input from Member States on response burden and production costs in accordance with Article 14(3) of Regulation (EC) No 223/2009. 1. The Union financial envelope for the implementation of the programme for 2013 is set at EUR 57,3 million, covered by the programming period 2007 to 2013. 2. Not later than three months after the adoption of the multiannual financial framework for the years 2014-20 (‘MFF 2014 to 2020’), the Commission is invited to submit to the European Parliament and to the Council a legislative proposal introducing the financial allocation for the period 2014 to 2017. 3. The Commission shall implement the Union financial support in accordance with the Financial Regulation. 4. The Commission shall adopt its decision on annual appropriations in compliance with the prerogatives of the budgetary authority. The financial allocation for the programme may cover expenses pertaining to preparatory, monitoring, control, audit and evaluation activities which are required for the management of the programme and the achievement of its objectives; in particular, studies, meetings of experts, expenses linked to the reimbursement of statistical experts, information and communication actions, expenses linked to IT networks focusing on information processing and exchange, together with all other technical and administrative assistance expenses incurred by the Commission for the management of the programme. The allocation may also cover technical assistance and expertise provided to Member States which are unable to produce certain European statistics or statistics of the required quality due to specific circumstances. In order to implement the programme, the Commission shall adopt annual work programmes which shall satisfy the requirements laid down in Article 17 of Regulation (EC) No 223/2009 and which shall set out the objectives pursued by them and their expected results, in accordance with the general and specific objectives referred to in Article 4(1) and (2) of this Regulation. Each annual work programme shall be communicated to the European Parliament for information purposes. Financial contributions by the Union may take the form of grants, public procurement contracts or any other interventions needed for the purposes of achieving the general and specific objectives referred to in Article 4(1) and (2). 1. A financial contribution by the Union shall support actions for the development, production and dissemination of European statistics needed for the purposes of achieving the general and specific objectives referred to in Article 4(1) and (2). Priority shall be given to actions with high added value for the Union in accordance with Article 2. 2. A financial contribution to support collaborative networks as referred to in Article 15 of Regulation (EC) No 223/2009 may take the form of grants for an action and may cover up to 95 % of the eligible costs. 3. Where appropriate, operating grants, not exceeding 50 % of the eligible costs, may be awarded for the functioning of organisations referred to in Article 12(3). 4. As a contribution to expenses incurred by the Member States in carrying out actions based on data collection, a lump sum per set of data, the complete results of which are to be forwarded to the Commission, may be paid up to a maximum threshold defined per data collection. The amount of the lump sum shall be defined by the Commission taking due account of the complexity of the data collection. 1. In accordance with the second subparagraph of Article 128(1) of the Financial Regulation, grants to the national statistical authorities identified in Article 5(2) of Regulation (EC) No 223/2009 may be awarded without a call for proposals. 2. Collaborative networks may involve beneficiaries referred to in paragraph 1 and other bodies without a call for proposals in accordance with Article 128(1) of the Financial Regulation. they have provided the Commission with satisfactory accounts of their membership, internal rules and sources of funding. 1. The Commission shall take appropriate measures to ensure that, when actions financed under this Regulation are implemented, the financial interests of the Union are protected by the application of preventive measures against fraud, corruption and any other illegal activities, by consistent and effective checks and, if irregularities are detected, by the recovery of the amounts wrongly paid and, where appropriate, by effective, proportionate and deterrent penalties. 2. The Commission or its representatives and the Court of Auditors shall have the competence to audit, on the basis of documents and on-the-spot checks, all grant beneficiaries, contractors and subcontractors who have received funding within the framework of this Regulation. The European Anti-Fraud Office (OLAF) shall, where appropriate, carry out on-the-spot checks and inspections of economic operators concerned directly or indirectly by such funding in accordance with the procedures laid down in Council Regulation (Euratom, EC) No 2185/96 of 11 November 1996 concerning on-the-spot checks and inspections carried out by the Commission in order to protect the European Communities’ financial interests against fraud and other irregularities (10), with a view to establishing whether there has been fraud, corruption or any other illegal activity affecting the financial interests of the Union in connection with a grant agreement, grant decision or contract funded pursuant to this Regulation. Without prejudice to the first and second subparagraphs, cooperation agreements with third countries and international organisations, and grant agreements, grant decisions and contracts resulting from the implementation of this Regulation shall expressly empower the Commission, the Court of Auditors and OLAF to conduct such audits, on-the-spot checks and inspections. countries to which the European Neighbourhood Policy applies, countries which have applied for membership of the Union, candidate and acceding countries, and the western Balkan countries included in the stabilisation and association process, in accordance with the conditions laid down in the respective bilateral or multilateral agreements with those countries establishing the general principles for their participation in Union programmes. 1. The Commission shall, after consulting the ESSC, submit an intermediate progress report on the implementation of the programme to the European Parliament and to the Council by 30 June 2015. 2. No later than 31 December 2016, the Commission may, on the basis of the intermediate progress report referred to in paragraph 1, and after consulting the ESSC, submit to the European Parliament and to the Council a proposal for the extension of the programme for the period from 2018 to 2020, while complying with the MFF 2014 to 2020. 3. By 31 December 2018, the Commission shall, after consulting the ESSC and the European Statistical Advisory Committee, submit a final evaluation report on the implementation of the programme to the European Parliament and to the Council. (1) Position of the European Parliament of 12 December 2012 (not yet published in the Official Journal) and decision of the Council of 20 December 2012. (2) OJ L 87, 31.3.2009, p. 164. (3) Without prejudice to Article 5 of Protocol No 4 on the Statute of the European System of Central Banks and of the European Central Bank. (4) OJ L 192, 22.7.2011, p. 1. (5) OJ L 298, 26.10.2012, p. 1. (6) OJ C 139, 14.6.2006, p. 1. (7) OJ L 73, 15.3.2008, p. 13. (8) OJ L 332, 30.11.2006, p. 21. (9) OJ L 340, 19.12.2008, p. 76. (10) OJ L 292, 15.11.1996, p. 2. (11) OJ L 90, 28.3.2006, p. 2. The implementation of Union policies requires high-quality, comparable and reliable statistical information about the economic, social and environmental situation in the Union and its components at national and regional level. European statistics are also indispensable for Europe, allowing the general public and European citizens to understand as well as to take part in the democratic process and debate about the present and future of the Union. The European statistical programme provides the legislative framework for the development, production and dissemination of European statistics over the period 2013 to 2017. European statistics are developed, produced and disseminated under that legislative framework through close and coordinated cooperation within the European Statistical System (ESS). Statistics developed, produced and disseminated under the European statistical programme 2013 to 2017 (‘the programme’) contribute to the implementation of the Union’s policies as reflected in the TFEU and Europe 2020 and its respective flagship initiatives and other policies set out in the Commission’s strategic priorities. Given the fact that the programme is a multiannual programme covering a period of five years, and that the ESS aims to maintain its role as a key player in the statistical field, the programme is ambitious in terms of scope and objectives, but the implementation of the programme will follow a step-wise approach. The development of an effective priority-setting and simplification mechanism will be an objective of the programme. The programme will strive to establish a statistical information infrastructure. This infrastructure has to be prepared for the wide and intensive use of various applications. Policy-making drives the decisions to produce European statistics. However, those statistics should also be available and easily accessible to other decision-makers, researchers, businesses and European citizens in general as they constitute a public good and are paid for by European citizens and businesses, who should benefit equally from the services provided. For the infrastructure to fulfil this role it has to be designed according to a sound conceptual framework which, on the one hand, ensures fitness for a range of purposes and, on the other hand, allows flexible adaptation to evolving users’ needs in the years ahead. Within this overarching scheme, the programme will further distinguish three pillars of statistical information: Business; People’s Europe; and Geospatial, Environmental, Agricultural and Other Sectoral Statistics. Union and relevant global policies are the instruments that specify the statistical requirements to which the programme will respond through the re-engineered structure and corresponding production processes. Therefore, each individual Union and global policy is reflected in the different components of the statistical infrastructure and is covered by specific activities in the programme. New policies identified in the years ahead will be covered by establishing new derivation paths of indicators/accounts based on the statistical data produced within the three pillars. The general objective of the programme is for the ESS to continue to be the leading provider of high-quality statistics on Europe. Objective 4: ensure that delivery of such statistics is kept consistent throughout the whole duration of the programme, provided that this does not interfere with the priority-setting mechanisms of the ESS. Those specific objectives are split into different priority areas described below. Objectives 1 and 4 are covered by ‘I. Statistical outputs’, Objective 2 by ‘II. Production methods of European statistics’ and Objective 3 by ‘III. Partnership’. 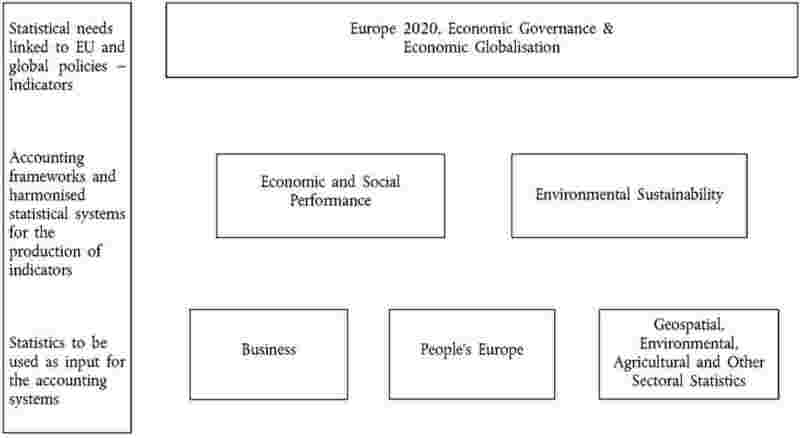 The endorsement of Europe 2020 by the European Council of June 2010 has shaped to a large extent the strategic agenda for the Union and national policies in the years ahead. That agenda establishes a number of headline targets and flagship initiatives for which statistical indicators have to be delivered by the ESS in a number of areas (i.e. improving the conditions for innovation, research and development, promoting employment, meeting Union climate change and energy objectives, resource efficiency, improving education levels, including learning mobility, active and healthy ageing, and promoting social inclusion through the reduction of poverty). Provide high-quality statistical information, which should be available in a timely manner, to monitor the implementation of Europe 2020. New indicators shall, to the extent possible, be based on available statistical data. employment indicators distinguishing between part-time and full-time employment, as well as indicators on unemployment that take into account people in activation policies such as training. The crisis and the tensions in the financial markets have highlighted the need to strengthen the economic governance of the Union. Decisive steps in economic governance and coordination have already been taken by the Union, some of which will have major statistical implications, in addition to ongoing statistical activities. Develop new and enhance existing statistical information relevant for Union decision-makers and the public at large in relation to the strengthened and integrated economic governance of the Union and the surveillance cycle integrating the Stability and Growth Pact and the economic policy. implementing a robust quality management in the production chain, also covering upstream public finance data and the underlying workflows in Member States. Provide Union decision-makers with reliable statistics and indicators for administrative and regulatory purposes and for monitoring specific Union policy commitments. the definition, as appropriate, implementation and explanation of a robust quality management framework for those indicators. The social, economic and other effects of the financial crisis, the increase in cross-border flows and the fragmentation of production processes have highlighted the need for a more coherent framework and enhanced measurement of globalised production. Enhance the indicators and statistical information available on economic globalisation and global value chains for Union decision-makers and the public at large. the examination of the need to reform the calculation and allocation of financial intermediation services. The Commission Communication of 20 August 2009 entitled ‘GDP and beyond: Measuring progress in a changing world’, and the publication of the Stiglitz-Sen-Fitoussi Report on the Measurement of Economic Performance and Social Progress have given new impetus to the key challenge for the ESS, namely how to achieve better statistics on cross-cutting issues and more integrated statistics to describe complex social, environmental and economic phenomena beyond the traditional measures of economic output. The European System of National and Regional Accounts (ESA) offers an integrated and consistent framework for all economic statistics that should be complemented by other indicators in order to provide more comprehensive information for policy- and decision-making. The economic crisis has reinforced the need to have a set of high-quality macroeconomic indicators to better understand and analyse economic fluctuations and their effects on society, and thereby facilitate the decision-making process. Increasingly globalised production makes it necessary to develop a consistent framework that facilitates the interpretation and integration of statistics from different domains. Supplement measurement of economic performance by different dimensions of globalisation, the quality of life, access to goods and services, environmental sustainability, health, well-being, social cohesion and social inclusion. Develop a framework for the analysis of globalised production. the alignment of the corresponding accounting and statistical concepts to the extent possible. Provide key macroeconomic and social indicators and Principal European Economic Indicators (PEEIs) as a coherent set of indicators addressing the Union and global statistical data requirements and adjust PEEIs to meet evolving users’ needs. the availability of harmonised housing and related statistics for all Member States. Protecting, preserving and improving the environment for present and future generations, as well as combating the effects of climate change, are very high on the European agenda and are objectives of the Treaties. Efficient policies in those domains require statistical information across various areas. Provide environmental accounts and climate change-related statistics, taking into account international developments in this area. the development of a headline indicator measuring global environmental pressure. European enterprises are the focus of a large number of Union policies. In addition, they are responsible for the provision of basic data. Accordingly, business statistics in the broad sense are in heavy demand to support the decision-making process but also to help European citizens and businesses understand the impact of those policies, differentiating between large enterprises, mid-caps and small and medium-sized enterprises for which there is an increased need for detailed and harmonised statistics. There is simultaneously a need to reduce the administrative and reporting burden. Increase the efficiency and effectiveness of statistical production processes. Provide high-quality statistics on key areas where enterprises are the centre of interest, such as business statistics, short-term indicators, their investment in human capital and skills, international transactions, globalisation, internal market monitoring, R & D and innovation, and tourism. Special attention should be paid to the availability of data in high value-added industrial or services sectors, in particular in the green, digital or social economy (such as health and education). the provision of statistics on resource use and resource efficiency based to the extent possible on existing data collection. European citizens are at the heart of Union policies. Consequently, social statistics in the broad sense are in heavy demand to support the decision-making process and to monitor the outcome of social policies, but also to help European citizens assess the impact of those policies on their lives and well-being. Provide statistics on key areas of social policy where the citizen is the centre of interest, such as well-being, sustainability, social cohesion, poverty, inequalities, demographic challenges (in particular population ageing and migration), the labour market, education and training, including childhood education, adult learning, vocational training and learning mobility of young people, culture, physical activity, quality of life, safety, health, disability, consumption, free movement and the internal market, mobility of young people, technological innovation and new lifestyle choices. Those statistics shall be disaggregated by gender where appropriate, for groups that are of special interest to social policy makers. Priorities shall be set in accordance with Article 6.
the commencement of preparations of the next census round (scheduled for 2021). The combination of statistics with spatially referenced data and geospatial analysis will offer new opportunities that the ESS will explore further. Specific issues, such as confidentiality and statistical validity of small area estimations, will need to be given particular attention. Energy and transport statistics to support Europe 2020 and climate change policy will be of high importance in the future. The significance of agriculture among the Union policies will remain during 2013-17. The statistical work will be strongly influenced by the outcome of the reflection on the Common Agricultural Policy after 2013. Focus will be on environmental, biodiversity/ecosystem-related, economic, human health and safety and social dimensions. Support evidence-based policy-making by a more flexible and increased use of spatial information combined with social, economic and environmental statistical information. the integration of statistical data when relevant, thus creating a multisource flexible infrastructure for the provision of targeted spatio-temporal analysis. Provide environmental statistics to support the policy-making process of the Union. A set of key environmental statistics on resources, such as on waste and recycling, water, raw materials deposits, ecosystems services and biodiversity at national and where possible regional level, and a set of key climate change-related statistics to support mitigation and adaptation actions and policies at all relevant levels from local to Union level. Provide energy and transport statistics to support the policies of the Union. transport safety, passenger mobility, road traffic measurement and intermodal freight transport. Provide agriculture, fisheries and forestry statistics for the development and monitoring of the Common Agricultural and Fisheries Policies, reflecting key European strategic objectives related to sustainability as well as rural development by carrying out regular activities related to the development, production and dissemination of statistics. the implementation and dissemination of a set of key forestry data from Integrated Environmental and Economic Accounting for Forestry, such as forest area, volume and value of standing timber and economic accounts for forestry and logging. The ESS is currently facing a number of challenges: increasing demand for high-quality statistics, a growing need for complex multidimensional statistics, the appearance of new actors on the information market, constraints on resources, the need to further reduce the statistical burden on respondents as well as the diversification of communication tools. This implies adapting the production and dissemination methods of European official statistics in a progressive way. Implement a quality management system in the ESS based on the Code of Practice. Strengthen the sharing of good practices in the implementation of the Code of Practice and ensure that quality reporting is targeting different user needs. the standardisation of quality reports in various statistical domains at Union level. The ESS is facing a major challenge: how to provide high-quality European statistics to satisfy increasing needs for statistics in a context of substantially reduced budgets of Member States and a zero-growth human resource policy at the Commission and in Member States which, for some bodies, will result in a real reduction in human resources. Given those resource constraints at European and national level, it is important to strengthen priority-setting and simplification measures, which require the commitment of all ESS partners. A priority-setting mechanism has been introduced as an integrated part of the preparation of annual work programmes and will be implemented throughout the duration of the programme. This involves, among other things, an annual review of existing statistical requirements, taking as its point of departure initiatives proposed by the Commission for reducing statistical requirements considering the interests of users, producers and respondents. The process should be pursued in close cooperation with users and producers of European statistics. Implement a priority-setting mechanism for the ESS in order to simplify reporting requirements and to adjust to new needs for statistics while taking into account the constraints on the producers, the response burden and the needs of users. the communication to users of the statistical areas to be simplified and of the data collection to be reduced/discontinued. Put in place gradually, taking into account costs generated in the ESS by implementation, an ESS business architecture allowing more integrated production of European statistics; harmonise and standardise statistical production methods and metadata; enhance the horizontal (across statistical domains) and vertical (across ESS partners) integration of statistical production processes in the ESS in respect of the principle of subsidiarity; use and integrate multiple data sources; produce multi-purpose statistics. Particular attention will be given to confidentiality issues that will arise with increased use, reuse and exchange of micro-data and administrative records. the improvement of the provision of metadata, namely background information on how data are collected, the quality of data and how to render data more readily understandable to users. Ensure the good functioning and coherence of the ESS through effective collaboration and communication. the further development and making operational of collaborative networks. Make the ESS the first data source on European statistics for all users and, in particular, for public and private decision-makers, by providing a high-quality statistical information service based on the principles of free and easy access to European statistics. Intensifying and extending the dialogue between users and producers of statistics to meet user needs for high-quality statistics. An early involvement of users in new developments is key to improving the effectiveness and efficiency of the ESS. Extend and rationalise the range of dissemination products to meet the needs of users using new technologies. Set up a cost-efficient, integrated and secure infrastructure within the ESS for access to confidential data for scientific purposes. the preparation of data sets to facilitate the use of statistical data for educational and research purposes. Satisfy learning and development needs in the ESS based on a combination of training courses and learning and development opportunities. Improve the collaboration between ESS members for the transfer of knowledge and sharing and implementation of best practices and common innovative approaches in the production of statistics. Organise the activities, participation and contribution of the research communities in the improvement of the statistical production chains and of the quality of official statistical information. the putting in place of adequate instruments for the exchange of practices and implementation of common solutions in the ESS. In the spirit of partnership, the national statistical authorities and the Commission (Eurostat) are responsible for the development, production and dissemination of European statistics. Implement the enhanced ESS governance framework. Enhance the coordinating role of the Commission (Eurostat) as the European Union’s Statistical Office. regular stakeholder dialogues at top management level. Strengthen the cooperation with the ESCB and the European and international organisations involved in the production of data for statistical or administrative purposes through common projects and coordinated developments. Ensure consistency between Union and international standards. implementing the new United Nations System of National Accounts, ESA, the United Nations System of Environmental and Economic Accounts, the European Environmental Economic Accounts and the Balance of Payments manuals. Promote and implement statistical advisory and statistical assistance activities in countries outside the Union in line with the priorities of the foreign policy of the Union, with particular emphasis on enlargement and the European Neighbourhood Policy. improving cooperation and coordination activities among the members of the ESS. (1) OJ L 354, 31.12.2008, p. 70. (2) OJ L 108, 25.4.2007, p. 1. (3) OJ L 251, 18.9.2012, p. 49.